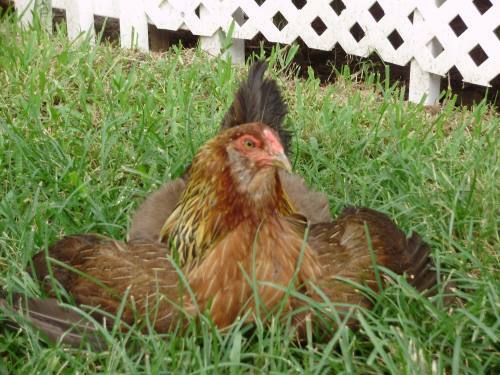 Peggy has been the most brooding hen I've ever known. She would sit on her nest with her one egg for endless days. Many times not leaving to eat or even to roost with the rest of the flock... When I did remove her into the grass and sunshine - She'd scream and squawk in desperation - not wanting to leave her egg. Her precious egg that never had the benefit of a rooster's charms. This went on for many months - She'd always fret. I'd always feel badly for her frustrated mothering desires. Well, a few weeks before Christmas I went to my flea market for some veggies and a Sunday browse. As usual I'd stopped to see my nursery-man Ralph who sold the best plants... And who I've been somewhat successful in nudging towards a (healthier) plant based diet. Well, Ralph also has chicken as "pets" (and for eggs) as well. I told him about Peggy's issues and he suggested to let her hatch some chicks. I didn't quite get how this would work without a rooster but he said if she really wanted to sit on some eggs... Any eggs would do - Like the eggs from his hen-friends that mingled and romanced with the roosters. Ah! Now I understood! The next day Ralph gave me 15 assorted eggs - probably all fertilized. I placed them in a nest box - and Peggy laid claim to them immediately. For 3 weeks straight she only left those eggs for water and food... Not all the play, digging, or sun bathing by her friends could get her to abandon her mission. Peggy was in her element! She dutifully rotated those eggs, keeping each at just the right temperature - Cooing a mantra in her task of motherhood. Hey - I'm me! peep-peep Who are you? cheep-cheep Where'd you come from? peep Are there more of us? cheep Isn't Mommy the best place to be? peep - peep... cheep - cheep. After about 24 hours Peggy left the nest with her little babies following her. She didn't go far... Maybe 2 feet. But the chicks ventured further. Then she'd fluff all her feathers to make herself huge. She'd flap her wings and let out a deafening screech. Each of chicks made a rapid retreat back under her. These were their first lessons to return to safety at her urging. For the first month they all slept in Mother's down - Tucked in every space available. Under and inside of her inviting wings... I don't know that anything was ever more serene to witness. In the month and a half since they've had daily teachings about where and how to scratch for bugs... How to dust bathe... And eventually how to perch at night. Peep - Cheep - Peep. 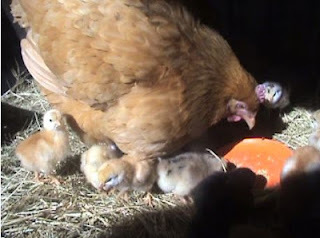 The chicks have climbed on her... Cooed and gently accepted her as a surrogate mom... At first Peggy wasn't so generous to "share" her chicks - But as they've gotten older I think she's grateful for the break away from her duties. And as you can see in this video - There was a particular bond with one chick named Miss. Miss for "misfit" as Peggy totally rejected her. Ran her away from the rest of the brood with a vengeance. Why? I have no idea but she and Cleo were inseparable. 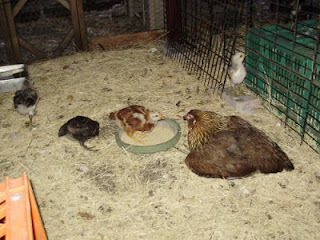 In today's industrialized world of mechanized chickens, it's not often a Peggy gets to be a mother hen. 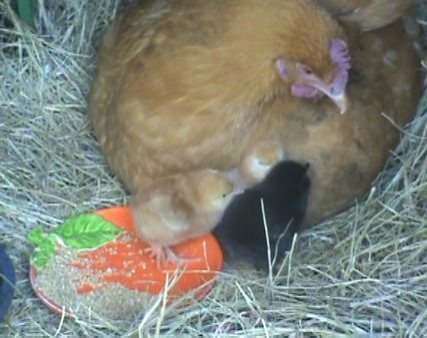 It's not often chicks know the genuine comfort of a nurturing parent. It's not often a rooster gets to protect a flock... For better or for worse - I wanted these things to happen. I had a hand in it all. And for all the negatives that were a concern (and I've whipped myself enough over them) - They pale in what I thought was the right thing to do at the time. So... For right or wrong - Happy Birthday Doris, Martha, Twiggy, Miss and Linda! You may have gotten here under some very strained and orchestrated circumstances... But I'm glad you did! Now you've got me worrying about Cleo. Happy Birthday to Doris, Martha, Twiggy, Miss and Linda from me too! What a great post...thank you Bea! Oops...I forgot...here's a real "wrong"...your link sender who thinks going vegan is "too extreme"...there's an example of a powerful and horrid "wrong". Hi veganelder - I wouldn't worry too much over Cleo. She gets a lot of special attention that makes up for immobility and isolation. Truth be told though... There's an obvious jealousy that stirs among the other girls. You must know with bunnies and other creatures that it's hard to care for everyone "equally". Someone always feels left out or slighted. I found treats for all to be the best distraction and equalizer. Hello HGV! Thank you & Happy New Year to you too! As far as the criticism goes in an egg-shell... I did something that in the AR world view I'm telling others *not* to do - Not to chickens, rabbits, cats, dogs etc. Isn't the message always that there are so many living beings that need homes already? I agree that in the whole scheme of things at least this wasn't an instance of a "class hatching" which fulfills no one's desires except human ones. This was a case that I tried to put Peggy's needs and Cleo's desires above the outcome of consequence. You are right though - Sometimes being "too strict" or "police-ish" is the very thing that can make vegan virtues impossible to live by in the RW.